Several Christmas-es ago, my husband received a gift of gloves. The shape of the double reinforced palm captured my attention, and I drew one of them. 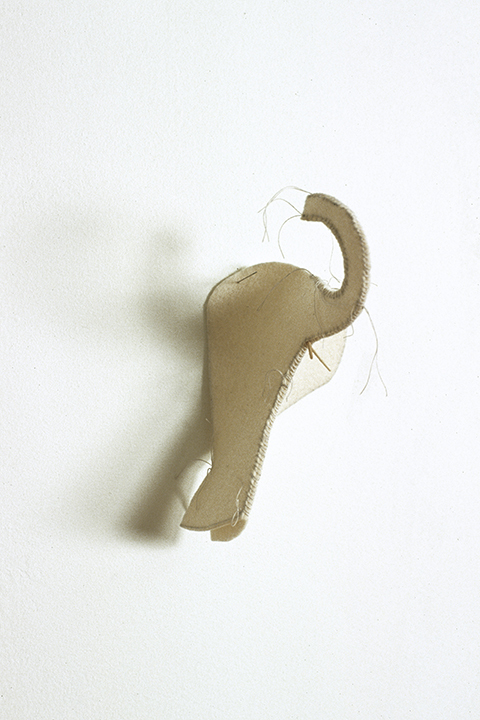 I ‘saw’ the drawing in cream colored industrial wool felt and constructed it by first cutting up the drawing to make a pattern -- some form of destruction seems an aspect of my process -- and then sewing the felt together with the same pale grey silk thread I’d been using in my paper pieces. 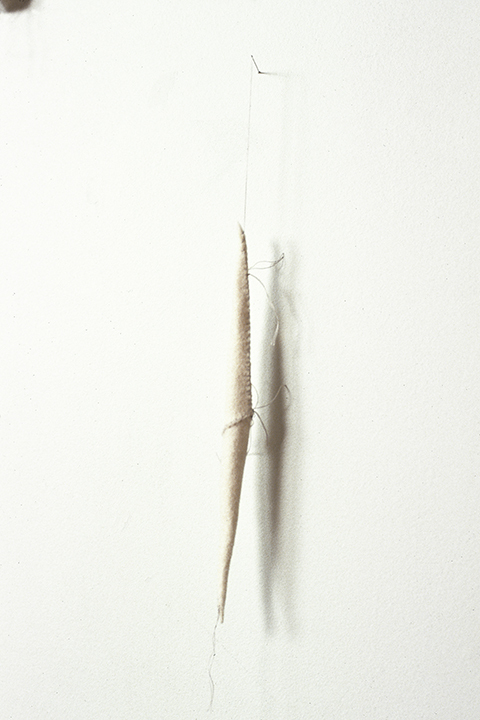 Silk thread and the stitched line have been consistent elements in my work. I struggled with the thumb. How to make it stick out at the appropriate angle? I pinned it to the wall through the index finger. Ouch! Though I made the glove be a glove again, still it wasn’t a glove one could actually wear. Was it an idea of a glove? It was white. Magician’s glove? Ghost of a glove? The importance of the hand and the handmade runs through my work, creating a relationship to the otherworldly through the commonplace. I discovered Peruvian knitted finger puppets in a shop on Greenwich Avenue. All told, I bought a suitcase full. I drew them and I drew my hands. And hands are particularly challenging. The drawings were evidence of a shift in my thinking: flat to in-the-round. My friend Beth Finch had seen the finger puppet drawings. In Europe she found a yellow felt chick finger puppet and thought of me. Many months later Beth visited the studio. I was expecting the finger puppet, but Beth announced that her cat(s) Button and Ohio -- which one she wasn’t sure -- had eaten/destroyed it. I got the idea to resurrect the absent chick from Beth’s description. 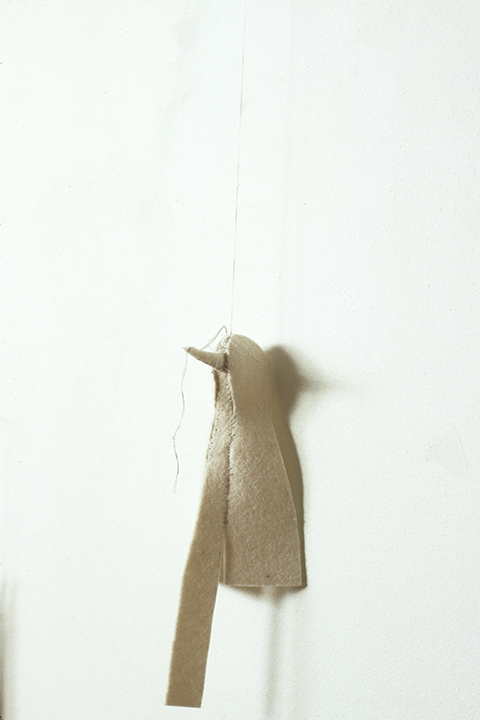 I built the chick around a finger-sized volume of space, architecture in miniature, and it dangled marionette-like from a threaded needle stuck directly into the wall. I made a bird, a fish, a figure with cadet’s hat and rascal’s smile, a worm, followed by another glove. They were either pinned directly to the wall or dangled like the chick. They were built around an interior space, with no additional interior support, and had something to do with the hand. I placed them at different heights in relation to one another and began to think of them both as notes on an invisible staff and snowflakes in unexpected configurations because they were white and because felt muffles sound like snow. A musical score for silence. I cut and separate. Cutting is a way to draw. I enjoy cutting thick dense wool felt. It is necessary to use a very sharp scissors and to cut without hesitation. 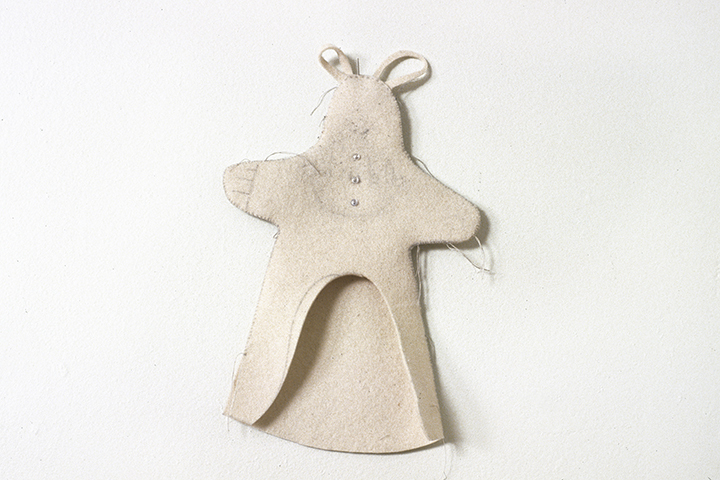 If I cut a piece of felt with a tentative or indecisive gesture, its edges lack grace and its form lacks energy. Unlike with paper, there’s only one shot. 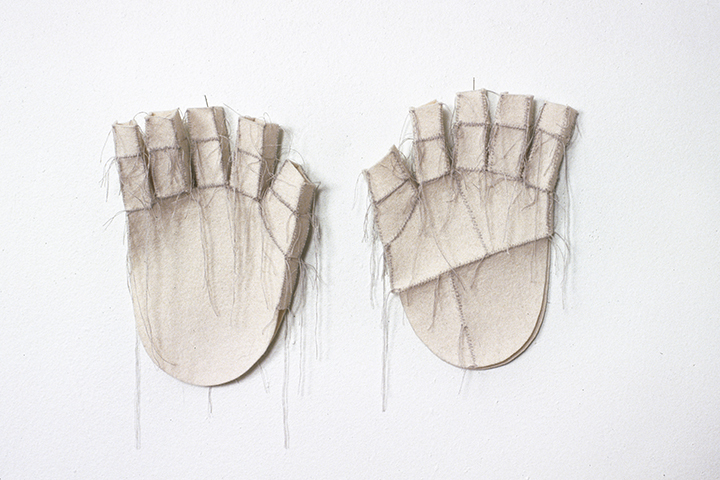 Sewing entails incremental gestures with an opposing result: holding together. 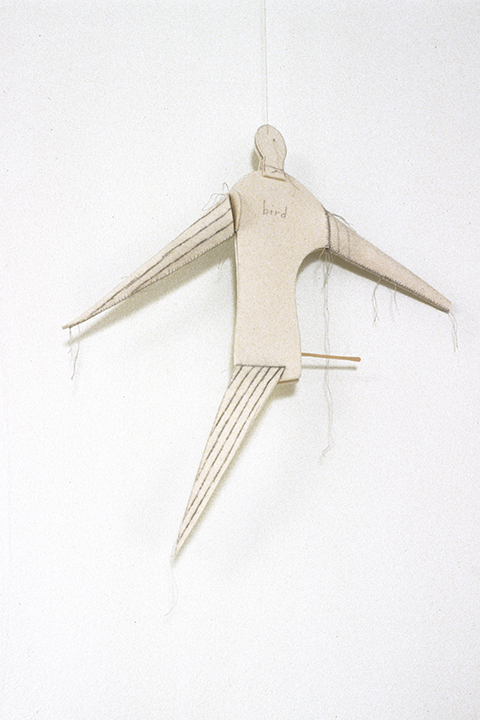 Using contradictory gestures I construct forms in which there is an opposition between flatness and dimensionality. There is opposition too between airy interior spaces and the inherent nature of the seamed felt that gives them form: weighty, compressed, tangled, smothering. A drawing/pattern begins the process that felt disrupts with its drooping and torquing. I am engaged by the risk of contending with unpredictability; I embrace unexpected results. On the Q train one winter morning I looked down to see a pair of diamond-patterned work gloves, palms down, thumbs and index fingers entwined. A tender declaration. More gloves, an oven mitt, an elephant, an oddly-scaled apron with clothespin in one pocket, and then a pocketbook with loincloth ‘rising.’ Which was a way of reminding myself how much I like tribal art and specifically, African. It was Beth again on one of her visits who introduced me to the art of a tribe from the Alaskan southwest through a book entitled The Living Tradition of Yup-ik Masks, Our Way of Making Prayer by Ann Fienup-Riordan, in which there are reproductions of both face and finger masks “used by shamans to facilitate communication between worlds (human and animal, the living and the dead).” In one finger mask the body of an animal is transformed into a human hand. 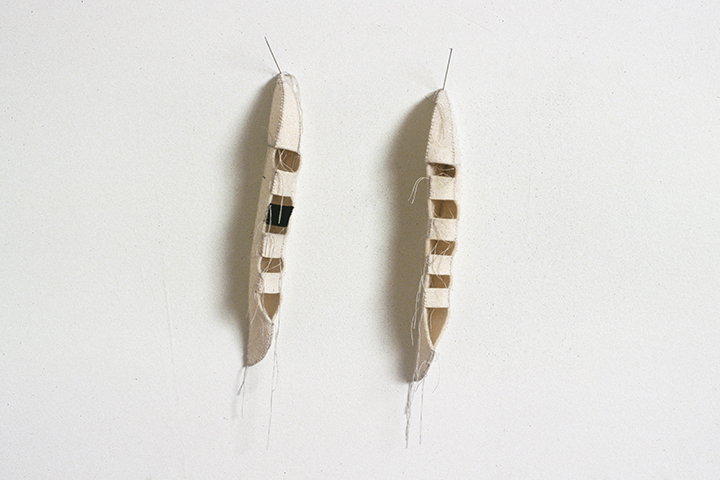 In another, tufts of caribou hair appear at the end of each wooden fingertip. When sewing, I have an intuitive sense not to tuck threads neatly away, but to leave them dangling and clumping like exposed roots. I challenged myself to make structures that were more complex. 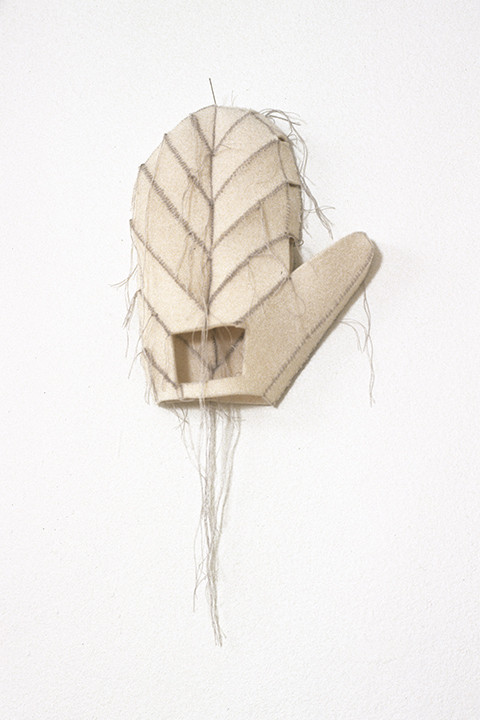 I wanted to keep the conversation open and playful and at the same time heighten the ‘charge.’ I made a driving glove/face mask with the growth pattern of a leaf, a spirally geometricized snail shell/donut/yoyo, a she-ram with pearl button, toothpicks and curving horns, a pair of seed pod/canoes, a snake with a head that resembles a bishop’s hat. 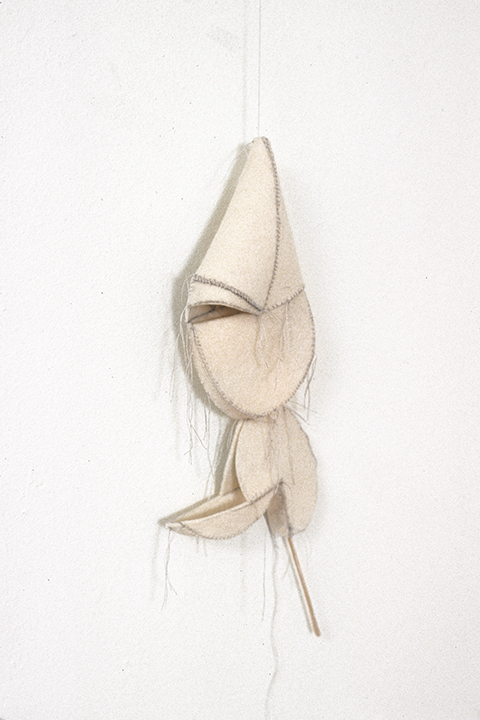 I began to expand my tonal range, including small amounts of black and brown-grey felt, and to incorporate felt of nearly imperceptible differences in thickness to keep my hands/eyes ‘awake’ and because each thickness draped and handled differently and projected a slightly different physical presence. I also responded to the subtle differences in each surface’s reception and resistance to the markings of my 2B pencil and the subsequent scrubbings of my ‘fabric eraser.’ I continued to make pieces, to arrange, re-arrange, remove, and replace them until the positioning on my studio walls ‘congealed,’ took on a voice. I have asked several composers if there is a direct relationship between the aesthetics of the drawing that is the musical score and the quality of the music that results, and they say there is. 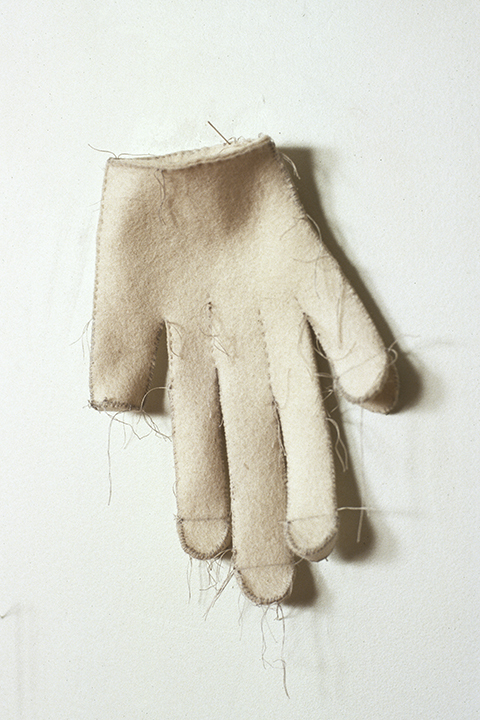 Polar Bear Glove Song is an installation incorporating 28 elements made of hand stitched industrial wool felt that is roughly the color of polar bear fur. 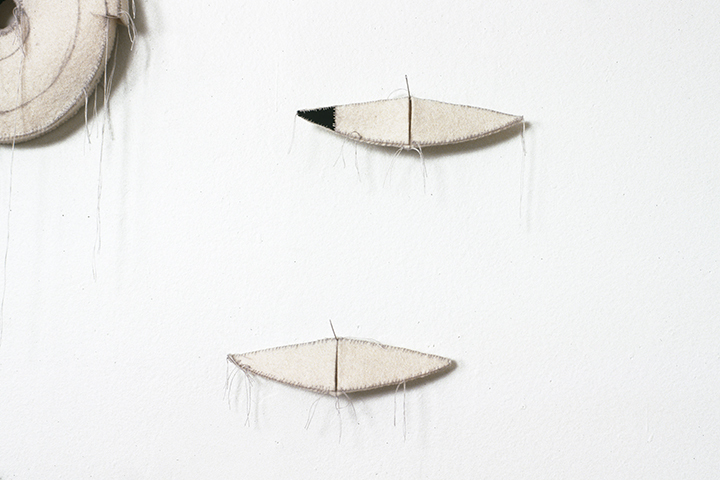 Each element is pinned to the wall or hangs from a thread like a marionette. It has the quality of a dream in which colliding worlds co-exist in suspended animation. 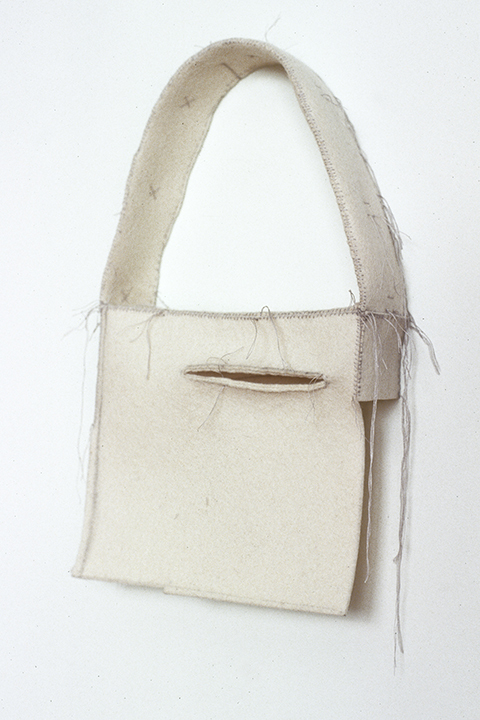 The felt is marked with pencil and occasionally studded with a glimmering sequin or shiny button. Wooden toothpicks, a craft stick and clothespin perform multiple functions: tusks in one, claws in another. The piece includes a text that is a re-counting of the process of its own making. 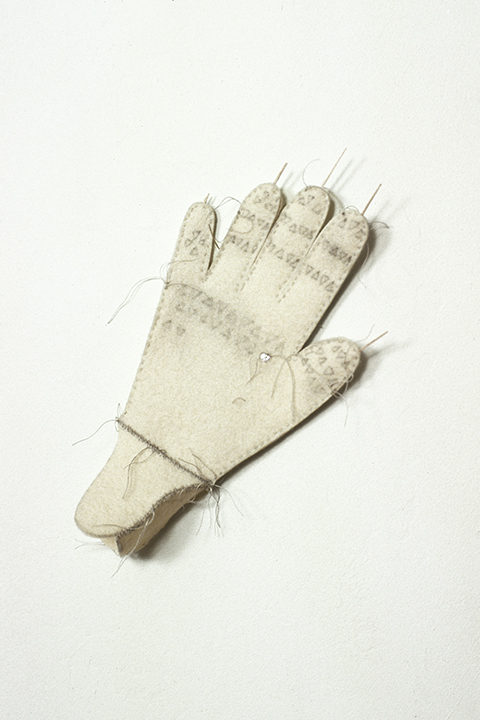 Polar Bear Glove Song was exhibited in Pins and Needles at the John Michael Kohler Arts Center in Sheboygan, Wisconsin, in 2003.